Tiger Bill Reviews Drum Therapy by Pat Gesualdo Book/CD from Alfred Publishing. As the developer of Tension Free Drumming Concepts, I'm certainly no stranger to the health benefits of drumming. My TFD concepts were developed to work with, not against, the body. Over the years I've taught many students not only with special needs but those who have had a number of medical issues and they have all benefited from drumming regularly. 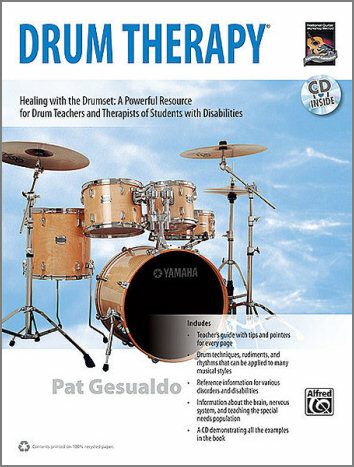 That said, I was especially looking forward to checking out this book by Pat Gesualdo who launched the non-profit organization DVD (Drums and Disabilities), which is an education program that has been used by psychologists, therapists, and teachers around the world. The first part of the book contains a series of drum lessons ranging from beginner through intermediate level. After a page that covers the matched grip and a few pages on reading music and drumset notation, you'll find some reading exercises followed by basic drumset beats in quarter-note, eighth-note, and sixteenth-note patterns. Shuffle patterns and funk-style syncopated patterns are next followed by a few pages covering double bass drum patterns and 23 basic rudiments. This section provides some general information on various disabilities and disorders and explains a bit about the workings of the human brain. The remainder gives us an overview of therapeutic techniques as they relate to various segments of those with special needs. Also included are the objectives of Drum Therapy along with methods on how to teach students with learning and coordination disabilities and hyperactivity (ADD/ADHD). The final section, which is meant for the teacher/therapist, takes you page by page through the Drum Lessons section explaining how to go about teaching each of the exercises to students based on their specific disabilities and includes the possible challenges that may occur. The book concludes with a glossary of common disabilities and disorders. An audio CD demonstrating all of the examples in the book. I applaud Pat for the work he is doing with his organization DAD (Drums and Disabilities). And although this book covers, as Pat himself describes "only the tip of the iceberg," it serves to inform both drum instructors and others in the health related fields of the tremendous benefits that drumming holds. I would like to add that drumming is not only beneficial for those with disabilities but can be invaluable as a means of getting and staying in shape for every person on the planet whether they ever thought of playing drums or not. For years I have been introducing drumming as a form of exercise to those who have never dreamed of drumming and received nothing but positive response. Even from the elderly in nursing homes, because drumming is so much fun and so easy to do. And whether you play an actual drum beat with all four limbs in a coordinated manner or just move all four limbs haphazardly, it doesn't matter. Your health will improve just the same. I recommend this guide to anyone interested in learning what is possible when you bring drumming to those with special needs. It could even help drum instructors, who may not be all that patient, to become better teachers to all of their students! Available at a retail price of $16.99 for the book/CD.